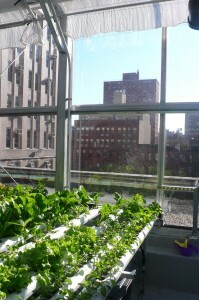 Last week, Carina and I visited the rooftop greenhouse at P.S. 333. I wrote about the opening of the greenhouse in an earlier post, so it was great to have the opportunity to see the project firsthand. We were met by founders of the Greenhouse Project Manuela Zamora and Sidsel Robards (both parents at P.S. 333), as well as NY Sunworks Executive Managing Director (and Hunter MUP alum) Laurie Schoeman and were given a tour of the 1,400 square foot structure, which is equipped with essentially every type of hydroponic system available. 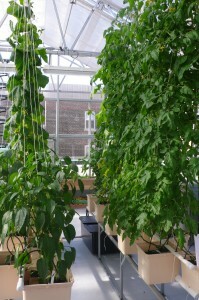 At capacity, the greenhouse can produce 7-8,000 pounds of food a year. But- according to Zamora and Robards- that isn’t really the point. For them, the Greenhouse Project is a learning laboratory- a place where children can experiment, grow food and, at times, fail at growing food- all as part of the educational process. They came up with the idea for the greenhouse after visiting the Science Barge, a floating hydroponic farm that is now harbored in Yonkers (just a short walk from the Yonkers Metro North stop). With the support of the school community, Zamora and Robards went about raising the three quarters of a million dollars- largely from sources outside of the school community- in order to construct the facility. They partnered with the non-profit organization New York Sun Works for the design, development and programming of the greenhouse. The project doesn’t stop there though. Zamora and Robards have since joined New York Sun Works as the Director of Educational Programming and the Director of Program Development respectively and are working, along with other New York Sunworks staff, to help other NYC schools implement their own greenhouses through the Greenhouse Project. And so, what started out as an idea hatched at the Science Barge, turned into the greenhouse that keeps on growing. While each greenhouse structure might be a learning laboratory for the students, the process itself is a (metaphorical) learning laboratory for all those involved. By blazing the train, Zamora, Robards and New York Sun Works have mapped out a process that other schools can both follow and adapt to bring these incredible learning opportunities to their communities.